In the world where the usage of smartphones became an integral part of most people’s lives, technologies and religion should coexist in peace and complement each other. Church apps can serve as a way to improve the interaction between people and their church or religious organization. They bring the opportunity to conduct online sermons or even receive donations from anywhere in the world. So, if you are interested in this topic, let’s consider the peculiarities that should be taken into account when creating useful and convenient religious mobile app. Before we start, it is worth mentioning that regardless of what faith your organization professes, this article contains the piece of advice that can be adapted to any goals and preferences you adhere to. What are custom church apps for? Let’s firstly look through the benefits that modern technologies can bring to your church or organization. Church app development is an excellent decision if church ministers want to communicate with parishioners who, in turn, do not mind to communicate with each other. It is able to send push notifications that can be adjusted to inform users about the church news, as well as deliver them the customized invitations on certain events. In addition, the church app can unite your church members into an active online community, allowing them communicating both within the application or go to a personal profile on social networks to continue the discussion there. In the modern world, a mobile app is a convenient way for making transactions. So, in your church app solutions you can add the opportunity to make donations, as well as share the donation link in social networks. The opportunity to stream videos can be very important since there is always somebody who cannot visit sermons or events for some reasons. Moreover, statistics show that 54% of young Christians watch online videos related to faith and spirituality. The mobile church app allows you reminding your church members about the forthcoming events dedicated to charity or volunteering. By sending them notifications, you may get more interested people involved in an event. Also, you can bring the opportunity to add photos from events, discussing them, as well as making donations to charity. The parishioners often discuss their difficulties and support each other in difficult situations. The presence of the mobile app for Android or iOS may greatly facilitate this. 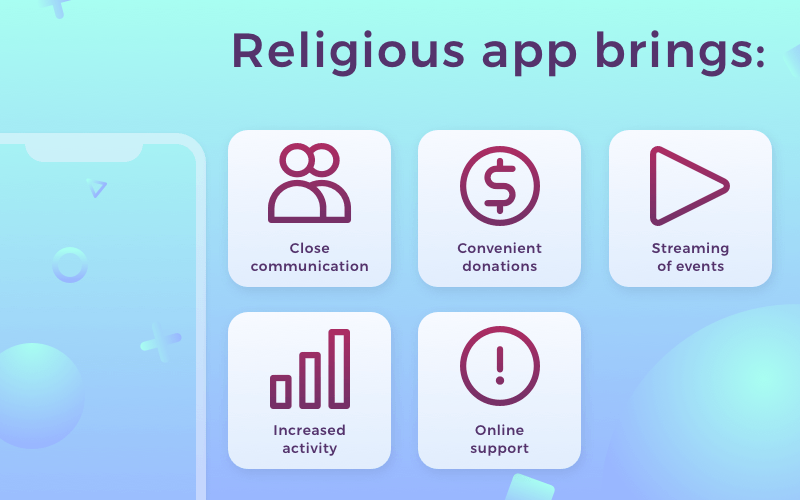 According to Christian Web Trends, social feature in religious apps was recognized as very important by 57% of the respondents, while 75% found that notifications (e.g. notifications of prayers) are one of the most important functions of these apps. Those were only several reasons why religious mobile apps can be useful. Except for everything mentioned above, you can also keep church records maintain a separate section for teaching children in an interactive way and so on. There are three types of religious mobile apps that can be singled out - for members of a church, for spiritual leaders, and for clerics. Let’s consider how different these types are. If to make a church app for members, you can easily spread the God Book among the members of your church. You do not need translating on TV channels anymore. Instead, you can use YouTube or Vimeo. The members of your church can register on events, propose podcasts, make records of preaching, donate through the application. For big churches, it is reasonable to include there a map of a campus, as well as events taking place in different rooms or classes of the church. However, a church app can also perform one single feature. For example, reporting the church’s news or allowing to read the Gospel and other religious texts. This kind of religious mobile apps is focused on managing groups of parishioners within the church. Such an app can be capable of tracking the attendance, as well as allow spiritual leaders making notes about participants of different groups. It can be protected by authorization so that no one could access to personal data of parishioners. If to create church app of this type, it will allow church leaders and clerics to interact with each other productively, as well as have a single access to the church database that, in turn, can be protected by a password. For instance, if a leader enters the attendance data along with some notes - they are automatically updated and synchronized so that clerics could see the changes through their personal profiles. That also gives clerics an opportunity to make the attendance reports, evaluate the level of parishioners’ participation in different events etc. That’s probably the first thing your church app should contain. You may provide members with the detailed information about the history of your church or organization, your goals, clerics, and ministry programs. The feed will allow your parishioners to always be aware of all the forthcoming events. Your church app developers can integrate the email system into your app, allowing to send monthly news or highlighting certain events. With their help, you could deliver messages containing attached files and links to the members of your church. Besides, GEO fencing can be used to adjust notifications in dependence on the area of living. A variety of users read the Bible on their mobile devices. So, you can provide them with such an opportunity within your custom church app. Besides, it is a good idea to add the opportunity for making personal notes. Donations are important for any non-commercial organization. Some churches collect donations during events. In order to organize it conveniently for your parishioners, you can send them notifications to remind about the possibility to make donations at any convenient time. For this feature, your Android or iOS developers will probably use a ready-made solution like Stripe or Braintree. This step will provide you and your users with an opportunity to share different events on social networks, as well as notes using your church app solution. You can connect websites like YouTube or Vimeo for placing or adding videos to your media library. You can also integrate audio sermons from iTunes or other audio stores, as well as create own podcasts and download audio files. By means of services like Live Stream or Ustream, you are able to conduct live broadcasts from your church app. This feature will help to keep up with events for those parishioners who cannot physically attend church services or certain events. You may allow your app's users to ask questions in chat, make calls or contact the representatives of the church in any other convenient for them way. There, users could write their thoughts concerning religious texts, keep quotations from The Gospels etc. Having a built-in gallery, users of religious apps get a possibility to load their photos that are connected with some church events, as well as make a selection of pictures with life-affirming quotes or quotations from the Gospel. This feature may come in handy for navigating through big churches. It is worth to point out that religious apps for children differ from those ones oriented on adults. So, there are several peculiarities on how to create a church app for children. This way, you should take into account the fact children should not be bored when interacting with an app. 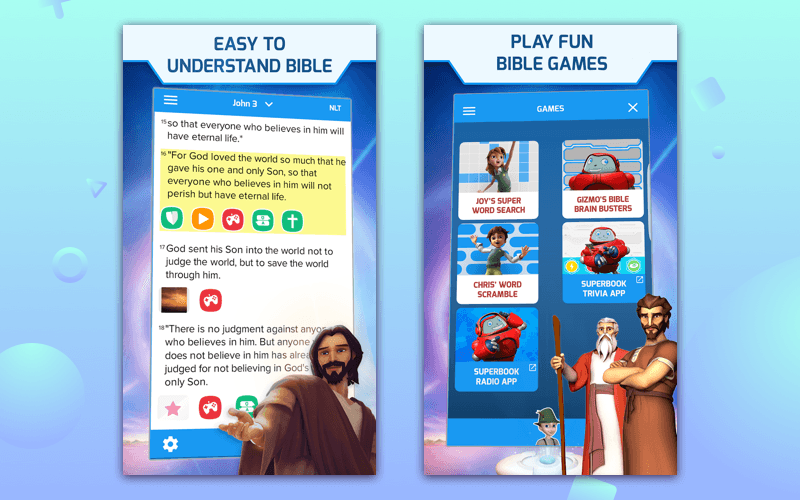 That’s why the best way out for religious apps for children is to entertain them by giving an opportunity to play games and solve interesting tasks. Do not forget about the rewards! However, you can rethink it somehow by adding videos and other interactive content. Such solutions adopted to the Bible reading are able to allow children to interact with its each chapter. Moreover, you may add a quiz at the end of each chapter. Also, it is a good idea to add to the church app different cartoons related to spiritual development, as well as the pictures of Biblical characters, artifacts, holy places along with a description of them. The main thing is to present the information in an easy and educative way. Contact our managers to get the free consultation and learn the church app cost. Do not forget to subscribe to our newsletters in order to stay tuned! Fill the form you see on the right or at the end of the page (in case you’re browsing on mobile).